I must confess that I was both excited and a little bit nervous when I attended a local public Imbolc celebration. My nervousness was dispelled almost immediately as I encountered a worship service whose form is nearly identical to mine! We began outside the gathering place where we were smudged and anointed. Incense and anointing with oil (they used milk to honor Brigid) are a part of my liturgical tradition as well, so it felt like home. The celebration itself had the basic form that Christians have used for thousands of years: GATHERING, WORD, MEAL and SENDING. The GATHERING included joyful singing and a lovely ritual where we tied pieces of copper wire together to form a chain. (Metalwork is one of the attributes associated with Brigid) We talked about what ties us together and forms community. The WORD portion included poetry and a message from one of the priestesses who led the celebration. It dealt with one of the themes of Imbolc: the seed breaking apart, sending out roots and drawing strength from the soil so it can grow in the spring. She talked about the need for us to focus on the things that ground us and give us strength as we prepare to grow in our spiritual life. As we say in my tradition “That Will Preach!” It’s not unlike sermons I’ve given myself. The MEAL was the biggest surprise of all. The celebrants offered pieces of Irish Soda Bread and a common cup of hard cider. The words they said to those who chose to partake of this symbolic meal was “May you never be hungry. May you never be thirsty.” It was a beautiful symbol of community and a wish for everyone’s well being. There were also several optional rituals people could partake in. 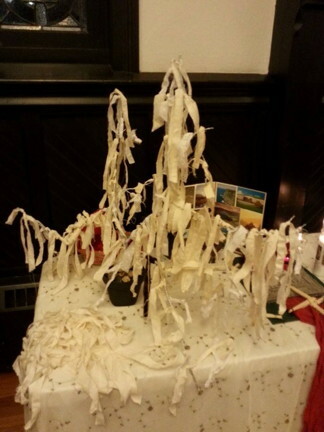 The first was to tie strip of cloth onto a branch, similar to the Celtic “clootie wells” in Ireland. The intent was to have the cloth hold our prayer wishes. There was also an opportunity to honor the goddess Brigid or sit silently and meditate. It was nice to have options that appealed to the different kinds of people who assembled there. The SENDING included more singing and a joyful benediction. The experience made me smile because so much of it was familiar to my own Christian tradition. I don’t think this happened by accident. Early Christian worship was definitely influences by Pagan Worship and I believe of of the NeoPagan rites have been influenced by the Christian tradition. There’s no reason why we can’t share with each other. I think it makes for a richer spiritual experience. I left that night feeling like a bridge had been built between our traditions. It set me on the path of learning I’m trying to document through this blog. There is already enough hatred in our world. We need all the people we can assemble who can bring love, light and healing to others no matter what their spiritual path is. Let’s learn from each other and celebrate the gift of life the Creator, the Great Mystery, has given to all of us. This entry was posted in Imbolc, Prayer and tagged Spirituality, Wicca. Bookmark the permalink.